There are known living descendants of those persons whose names are coloured RED. Living descendants of others no doubt exist but have yet to be found. The earliest documented MacPhersons in our family history are Duncan  & Mary (Maclean)  McPherson. There is no record of them other than in the death certificates of their sons Malcolm, Angus, Martin & John, in which they are named as parents. Duncan is described as a crofter, however, he probably started as a joint tenant in one of the old-form townships, rather than the lotted crofts of the 19thC. Their sons were born in the last quarter of the 18thC, so Duncan & Mary were posssibly born about the 1750s-60s (there may have been other children whose records are missing). The sons, apart from Martin, who is recorded as having been born in Minginish, Bracadale, were born in Sleat. Malcolm  (abt 1780-1863) and his wife Flora McPherson  (she probably died pre-1851) had 6 sons & 3 daughters, most of whom were born in Tarskavaig in Sleat. Malcolm was a crofter. Angus  (abt. 1791-abt. 1847), the second son, married Subina/Sybilla MacDonald  (abt 1794-1886). Angus's family lived at No. 3 Kilmore, Sleat from at least as early as 1824 (after 1858 on the half-croft No.3a of about 4 acres). They had 3 sons and 3 daughters. Angus was a crofter. Martin  (abt. 1794-1869) lived on a half-croft at No 3b Kilmore, Sleat, with his wife Janet Macpherson  (abt. 1796-1880) and their family. They had 3 daughters and 5 sons. Martin was a crofter. Martin was named as the father of Isabella McPherson on her death certificate. Isabella's mother was Mary McPherson (d. of John & Ann McPherson), who died at Kilmore in 1863, given age 80 years. Isabella had a son named John Campbell. Isabella died unmarried at Sasaig, Sleat, in 1876, age given 61 years. The youngest son of Duncan & Mary, John,  (abt. 1797-1873) married Mary Russell , daughter of George & Margaret (Marshall) Russel, in 1828. John was the only one of the brothers known to have lived outside Skye. They had 5 sons & 3 daughters, born in Barony parish, Glasgow. Mary died in 1847 (from headstone in Kilmore burial ground, Sleat). John was described as a 'general merchant' in the 1851 Census in Sasaig, Sleat. 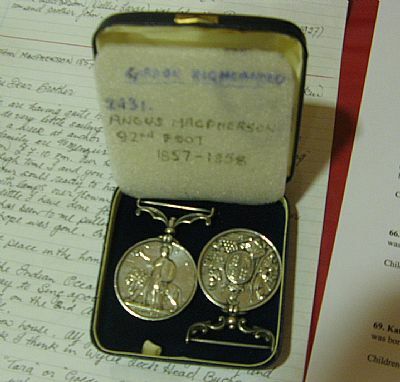 Some years after his wife's death, John was named as father to two children born to Catherine Nicolson - Ann Nicolson McPherson was born in 1859 and Alexander Nicolson McPherson in1861. Ann married Angus McInnes in 1882. They had 5 sons and 3 daughters. Catherine Nicolson died at Sasaig, Sleat, in 1885 age given 56 years. Malcolm  & Flora  McPherson's Family. Duncan  was born in 1813. There is no further record of him. Donald  (1815-1880) married Catherine MacDonald  (1830-1904), daughter of Alexander & Mary (Matheson) MacDonald, in 1859. Mary  (born abt. 1816) married Donald Stewart  in 1835. Duncan  was born in 1817. He was an unmarried Gaelic teacher, living with his sister Effie, at Torrin, Strath, in 1851. John , born in 1819, married Margaret Maclennan in 1852. Hector  was born in 1822. He married Elizabeth (Bessie) Macleod  , daughter of Donald & Catherine (Robertson) Macleod. They had 4 sons. Hector lived in Harrapool (Broadford) and gave evidence to the Napier Commission in 1883. Margaret  (1825-1893) married Donald McPherson  (d. 1874), son of Malcolm & Mary (MacDonald) McPherson. The family, which included 3 daughters and a son, lived part of their lives at Kylerhea. Malcolm  was born about 1828. Effie  (b.1831) married Donald Mackinnon  in 1853. Angus  & Sybilla  McPherson's family. Duncan  , Angus & Sybilla's first son, was born 16 December 1816 in Kilbeg, Sleat, Skye. Duncan emigrated to Australia with his wife Mary (1824-1899), daughter of Angus & Isabel (McPherson) MacDonald in 1848. In 1851, Duncan, shoemaker, given age 33, was living in the home of his in-laws Angus & Chirsty MacDonald in Ferindonald, with his wife Mary and daughter Mary, given age 6 months. Reputedly due to famine and lack of work, Duncan & Mary, with children John & Mary, emigrated to Australia from Liverpool on the 'Hornet' on 29 July 1854, arriving at Geelong on 23 October 1854. 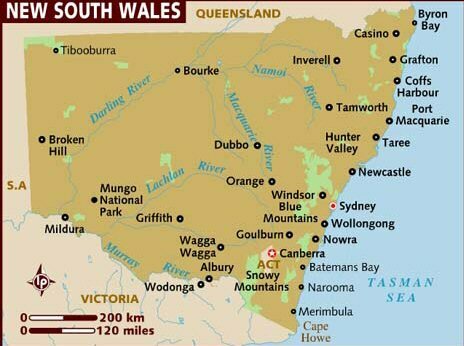 They settled and farmed at Cumberoona, near the present city of Albury (close to the border with the State of Victoria). Duncan & Mary had 4 children born in Australia...... Alexander, Isabelle, Sophia & Angus. Duncan died on 25 December 1897 at Bowna, Albury, NSW, Australia aged 81. Mary, his wife, died two years later in Cudgewan, Victoria, Australia. In his obituary, Duncan was described as "of the stuff whereof pioneers are made...Patriotic, like most of his country-men, he was always ready to talk about Scotland." Some of Duncan & Mary's descendants are pictured at a reunion in NSW (see image on Home Page). Mary  (1819-1900) married Donald MacKinnon . They had a son Angus . Janet  was born in 1822. Donald , born 1831 married Christy Robertson  (b. 1835 in Suisinish), daughter of Neil & Margaret (MacLeod) Robertson in 1860 at Kilmore. They had 5 daughters and 2 sons. In censuses, Donald was described as a fisherman until 1871, when he was a crofter in Sasaig. He died aged 83 in 1907 aged 82, according to his death certificate. Chirsty died 7 years later (see headstone image). Effie  (abt. 1837-1900) married Hugh/Ewen Robertson  in 1866. Their children were Mary , John , Janet  and Sybilla  (see headstone image). Malcolm , born about 1833, gave evidence to the Napier Commission in 1883. Martin  & Janet  McPherson's Family. Effie  (1821-1900) married Donald Robertson  (1821-1907), son of Malcolm & Catherine (MacDonald) Robertson in 1857 at Kilmore. They had 2 sons and 2 daughters. Duncan  (abt. 1825 - d. 1908 at 33 Smith St., Glasgow) married Alexandrina/Alexina Macleod  (b. 1827 Achiltibuie - d. 1914 at 33 Smith St., Glasgow), daughter of John & Annabella Macleod, in 1855 at the Free Church, Ullapool. Alexina's father John was a catechist/teacher in Coigach. 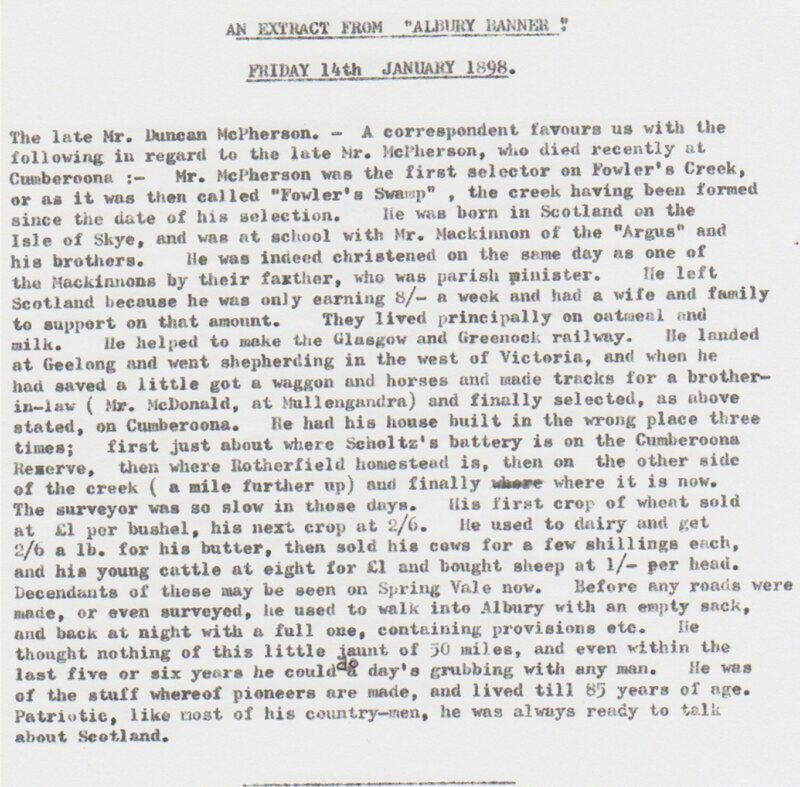 Duncan was a merchant seaman and the family lived in various parts of the NW Highlands - Ullapool, Lochinver, Portree, Kyleakin. They had 3 sons and 4 daughters. In the latter part of their lives, Duncan and Alexina lived in Glasgow - at Blackburn St. (1891) and with their daughter Jessie in Smith Street. Duncan & Alexina were buried in Sighthill Cemetery, Springburn, Glasgow (Lair No. 88). Angus  (1826-1905) was unmarried. Although he was born and died in Kilmore, Angus, a 92nd Highlander (Gordon Highlanders), spent a good part of his service (1847-? ?0 overseas, in the Ionian Islands, the Crimea and Indian. He was awarded the Indian Mutiny Medal and the good conduct and long service Medal. In the latter part of his life, Angus, a Chelsea Pensioner, occupied croft No.3b, Kilmore with his unmarried sister Ann. Margaret/Mary  married John Kennedy, son of Malcolm & Mary (MacPherson) Kennedy in 1865 at the Free Church, Knock, Sleat. They lived in Bridge of Weir and Ayrshire. They had 2 sons and a daughter. John  was born about 1834. Malcolm  (1839-d. 1891-1901), a mason, married Effie  (b. 1841, Calligarry, Sleat, d. 1904, Milton, Glasgow), daughter of Donald & Marion (McPherson) Robertson in 1871 at 40 Berkley St., Glasgow. Their 4 sons and 2 daughters were born in Glasgow and were recorded as English and Gaelic speakers. Ann  was born in Nov. 1842 and died in 1908 at Kilmore. John  & Mary  McPherson's Family. Four of their children and their families emigrated to the United States of America. Duncan  was born abt. 1823 in Barony, Glasgow. In 1841, his occupation was apprentice carpenter. In July 1849, he married Mary Howard , who was born in Wigan in 1826, in St Nicholas, Liverpool. They had one daughter. In the US 1870 census, they were living in Kings County, New York. Mary died on 16 July 1872. In the 1875 & 1880 cenuses, Duncan's sisters, Mary & Isabella respectively, were recorded visiting them in New York. Duncan was a shipping agent. He funded the erection of a headstone to his parents and brother William in the Kilmore burial ground in Sleat, Skye. He died in Kings, New York on 19 March 1881, having left his estate to his three sisters and to his daughter, Rebecca. Isabella  was born about 1824, and died in 1910. According to census records, Isabella was a dressmaker living in Ferindonald. She was unmarried. In 1880, she visited her brother Duncan in New York and was a beneficiary of his will of 1881. John  was born in 1827 in Barony Parish, Lanarkshire. In 1849, he married Elizabeth Rose , daughter of Robert & Mary (Walker) Rose, in Hamilton, Lanarkshire. Between 1851 and 1853, John & Elizabeth emigrated to the U.S.A. They had 4 children born in New York. John contested his brother Duncan's will of 1881 in a court case which he lost. At the time, he was living with his wife at 262 West 47th Street, New York. Hugh  was born in 1829 in Barony Parish, Lanarkshire. Mary  was born in 1831 in Barony Parish, Lanarkshire. She was unmarried. In 1875, she visited her brother Duncan in New York and was a beneficiary of his will of 1881. Mary died in Ferindonald on 5 June 1899. Elizabeth  was born in 1832 in Barony Parish, Lanarkshire. She married Alexander McKay , son of Dougald & Anne (Jenkins) McKay, in 1857, at 28 Abbottsford Place, Glasgow. Alexander had been born in Thornliebank, Renfrewfrewshire. While in Scotland, he was variously described as Cotton Bleachfield Labourer, Mechanic at dye works, and Engineeer. Elizabeth & Alexander had a 4 sons & 3 daughters born in Scotland. They emigrated to the U.S.A. in 1869. They had 3 more sons born in the U.S.A. In the U.S.A., Alexander was a merchant. Elizabeth and Alexander lived in Rhode Island and latterly in Saratoga Springs, New York, where Elizabeth died in 1897. In 1900, Alexander, who had remarried, was recorded living in Saratoga Springs with his wife Martha and step-daughter Bertha E. Andrews. Hugh Russel  was born in Rutherglen, Lanarkshire, in 1835. William  was born in Gorbals, Glasgow, in 1837 and died three years later. He is commemorated with his parents on a stone at Kilmore burial ground, Sleat, Skye.